these caves could be the largest world caves.The caves which have been recently discovered are thought to be so huge that it can accommodate a New York City block of skyscrapers.The marvellous cave also contains a thundering Rao Thuong Rivera and jungle (its name translates to “mountain river cave”) and even its own thin clouds, and its end remains out of sight. It’s part of a network of about 150 caves in central Vietnam near the Laotian border- many of which have not yet been surveyed. A husband and wife team of explorers discovered these caves residing along Annamite Mountains.Howard and Deb Limbert of England earlier too tried to enter Hang Son Doong in 2009, but their expedition was obstructed due to 200 foot calcite wall. The team recently returned to climb the wall and try to find the cavern's end. This magnificent cave was around 2 to-5 million years ago by the slow erosion brought about by river water against limestone under the mountain which caused the limestone to weaken and the ceiling to collapse and create the world’s biggest skylights. Both Hang Son Doong cave and the park are miracles of nature filled lush ancient surroundings that make you feel like you’re sure to see a Jurassic creature of some sort enjoying its lush green hidden places in this exceptional environment. Son Doong cave, said to be the world’s largest and most beautiful cave discovery, is estimated to be over 200 meters wide, 150 meters high, and around 9 kilometers long. Son Doong is filled with huge caverns as long as a city street and double the size of Malaysia’s Deer cave which was reported to be the world’s largest until Son Doong was found, along with its extensive, rushing, underground river whose sounds used to frighten locals before the cave was discovered. 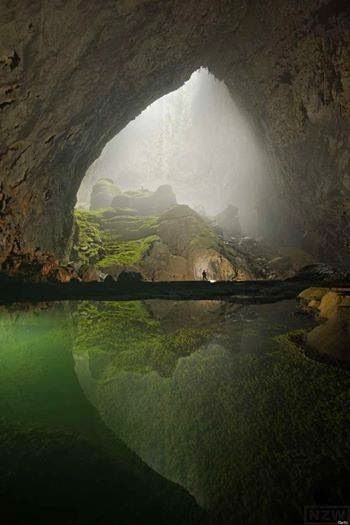 A local man stumbled upon the Son Doong cave 1991 however when he tried to return to the cave he couldn’t find it again. Luckily in 2009 British scientists surveying the area found it again. Son Doong cave is part of a network of over 150 caves in the Annamite Mountains, many that still haven’t been surveyed. The cave iinteractive map of the river cave's path.s as as wide as 300 feet and more than 600 tall – big enough to fit half of a Chicago downtown block filled with nearly 50-story buildings - larger than any known to date in the world.A great collection of photographs taken in Hang San Doong and other newly explored caves have been published in the January issue of National Geographic and even on its website. It actually takes 6 challenging hours to walk through a long forested path, starting at the Truong Son Highway, to arrive at Son Doong cave. Son Ðoòng is extremely challenging to explore and during the initial expedition of the cave, a team of scientists only made it 2 1/2 miles in before encountering a muddy calcite wall, 200 feet tall that ended the exploration. Above the wall they could see an open area with light peeking through but sadly for them, they had to wait to find out what was beyond what would soon be referred to as “the Great Wall”. Phong Nha Park features an extraordinary amount of evidence of our earth’s history and in 2003 was listed as a UNESCO’s World Heritage Site. The park has the longest underground caverns, rivers and passageways. Among the parks grotto systems and inside Son Doong cave, it’s likely that lucky scientists have found their own perfect place to relax, deep within the cave, and look with awe upon their surroundings that hadn’t been seen by the human eye, almost since the beginning of time. Graced by beautiful, ancient, almost ethereal environments, including surreal rock formations and some of the most breathtaking and widest sand banks in the world, it’s no surprise the Son Doong cave was found here. It’s exciting to imagine how many more caves and one of a kind chill out spots Phong Nha-Ke Bàng National Park has hidden away within its borders.